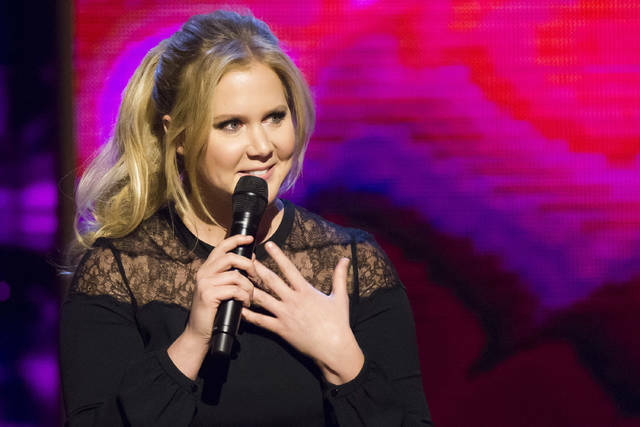 FILE - In this Saturday, Feb. 28, 2015 file photo, Amy Schumer appears onstage at the Beacon Theatre in New York. On Friday The Associated Press has found that a photo circulating on the internet showing Schumer splattered with blood and tearing a doll apart was doctored. The photo is paired with a quote falsely attributed to her about fetuses and abortion. The facts: Rose Mallinger, who died at age 97 after being shot at her Pittsburgh synagogue while worshipping Saturday, was not a Holocaust survivor, as widely reported online. Born in the early 1920s, Mallinger was alive during the Holocaust, but family members and the congregation’s rabbi said she was not among European Jews persecuted by Nazi Germans, who were responsible for the mass murder of millions of Jews during World War II. The photo attached to the post also is incorrect. A search of photos online revealed the woman in the photo to be Ata Kando, a Hungarian-Dutch photographer, not Mallinger. The facts: An image circulating online that shows Schumer splattered with blood and tearing a doll apart was doctored. The photo is paired with a quote falsely attributed to Schumer: “Fetuses aren’t people and have no right (sic), if you can’t get an abortion just get rid of it when is (sic) born.” Canadian photographer Melissa Trotter told the AP that she took the original photograph earlier this year. In the doctored photo, Schumer’s face was substituted for that of the original model. “The shoot was never about abortion or any sort of political commentary,” said Trotter, whose shoots are typically horror themed. The facts: Tents given to members of the migrant caravan working its way to the U.S. border were supplied by the Guatemalan Red Cross, Honduran Red Cross and Mexican Red Cross organizations, but not the American Red Cross. A tent featured in one of the migrant photos used to make the false claim has the Red Cross symbol and is labeled with the words “Cruz Roja Mexicana,” which translates into Mexican Red Cross. “In line with Red Cross fundamental principles, the Guatemalan Red Cross, Honduran Red Cross, and Mexican Red Cross have been providing aid such as medical care, drinking water, and family reconnection services to migrants walking through Central America and Mexico,” The American Red Cross said in a statement.